In a recent webinar Centercode’s CEO, Luke Freiler, discussed how companies can increase the return on investment (ROI) of their beta programs. (If you missed it, you can watch the entire presentation and download the slides here.) One of the most interesting parts of the presentation was a big picture look at how beta testing impacts different aspects of a product’s development, launch, and release. Beta testing’s role is to validate your product and ultimately make it more profitable. It achieves this in two ways. The first is by driving down key costs and risks. The second is by improving the product in measurable ways. The graphic below illustrates this function of beta testing (click on the image if you’d like to see a bigger version). The items along the red axis are things that beta can decrease as the product moves from development to launch and into release. The items along the green axis are areas where beta can make a notable improvement to the product. 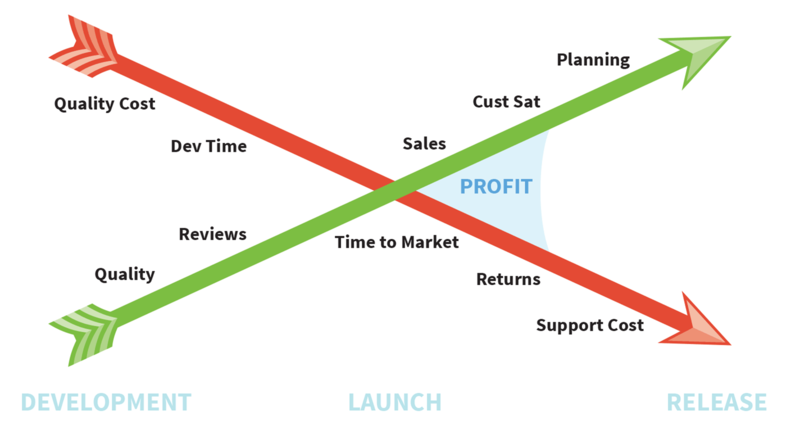 The more you limit costs and improve product success, the more profitable your product is, as show by the blue areas between the two axes. Quality Cost – By getting your product into the hands of diverse volunteer testers, you’re able to both decrease the cost of searching for those bugs before launch and decrease the time your QA team will spend after launch testing for bugs found by your customers. Development Time – By getting your development team more information about bugs faster they can solve them better, saving you the cost of their time during development. It’s also much more expensive to solve bugs after release compared to before, so finding bugs during beta can save you money in that way as well. Time to Market – An efficient beta test can help you improve your product faster, getting it launch-ready sooner. Returns – By understanding and improving the quality of your user experience you decrease the likelihood of customers returning the product, which can be a costly aspect of the equation. Support Cost – Beta helps your support team in two ways. First, it helps you find and fix bugs before launch so they never have to deal with them. Second, it prepares your support team to handle known bugs more effectively, helping to decrease the costs associated with your support desk. Quality – As we mentioned, beta testing improves the quality of your product as a whole, making it more reliable and appealing. Product Reviews – Since you already tested the waters with your beta testers and improved the product based on their feedback, you can be confident that your product reviews are going to be better. Sales – With good quality and glowing product reviews under your belt, you’ll see increased sales of the product. Customer Satisfaction – Since beta testing helps to improve your product and your support systems, you increase the likelihood that your customers are going to be happy with their experience with your product and your brand. Planning Efforts – Finally, all the data you gathered during beta can help improve your planning efforts for future versions of the product, getting your next product development cycle off on the right foot. By looking at beta testing in this way you can really see how a strong beta program can make or break the success of your product. Beta, by it’s very nature, touches every part of your product, and thus can affect the success of every part of the user experience. This means that beta testing is in a better place to impact the overall success of your product than any other aspect of product development. We dive into the nitty gritty of beta testing ROI in this free resource and in our recent webinar. To watch the full webinar and download the slide deck, visit Pragmatic Marketing’s webinar page. Measure the impact of your beta with our ROI kit!